How To Install iVMS-4500 for Smart TV (Samsung/Sony/LG)? How To Install iVMS-4500 for Smart TV? The best part about owning a smart TV is that you can install a wide range of apps directly on your TV, instead of using your mobile devices. Let’s how to set up iVMS-4500 for Smart TV to monitor live video. Smart TVs definitely changed our lives, as they are similar to computers these days, allowing you to perform a wide range of tasks with their help. If you are using a surveillance camera system or you intend to use one very soon, the idea of monitoring the available cameras on your smart TV may sound very appealing to you. The iVMS-4500 app for TV will allow you to access the surveillance cameras you use, at home, at the office, warehouse, or any other space you would like to monitor, without the need to have those cameras connected to the TV with an HDMI or VGA cable. So, you can install this app on your smart TV, but you need to have a bit of patience to complete this and you will also need some pieces of equipment to make the installation process happen. A USB memory stick that is generous enough to accommodate the app. A USB mouse that will make the installation process smoother for you. And a mobile phone that works with an Android OS. What to do if your mobile phone is not an Android device? In this case, besides the previously mentioned items, you will also require a USB keyboard and USB Hub. You will also need special software to complete the installation properly. So, besides the iVMS-4500 app for the smart TV itself, you will also need a File Commander for Android. It is worth mentioning that this kind of software can be downloaded directly onto your TV. Download the iVMS-4500 app by opening Google or even the online portal of Hikvision. You may not find the iVMS-4500 app by looking directly on the Play Store, as in spite of the fact that your smart TV uses Android technology, the TV does not see it as suitable for use. This is why you will have to look for it manually. Also, it is recommended to download the HD version of the app, so that it will be displayed in an adequate manner, not in portrait mode, on your TV. Download the File Commander for Android on your TV, as mentioned earlier. Introduce the USB stick into your smart TV. Just make sure to have the box next to the “Allow installing unknown apps” ticked, in the Security Settings of the TV. Open the File Commander and look for the APK, or extension for Android Apps, in the stick you just inserted. Then proceed to install the app on your TV, in the same manner, you installed other apps on your smart TV. In case you can’t see the app on the TV’s home screen. You can choose to use a custom home launcher or access the Settings of your TV. Select Applications, select the iVMS-4500 app and then click on “Open”. At this step, you will have to use the USB mouse, as the remote control will not do you any good. Having the mouse’s cursor in hand will make things much easier and you will be able to select the “Region” and then the “Devices” sections featured by the app. Use a USB keyboard or install Android TV Remote on your mobile device in order to fill in the required information within the app, as this is something you won’t be able to do with the remote control. You will have to make the settings in order to use the app. When it comes to setting the IP, it is recommended to go for the local IP of the DVR or NVR cameras. Use the mouse once again to save all the settings you made. 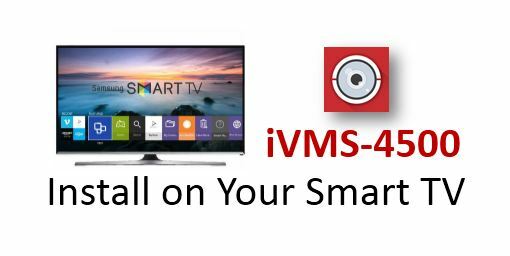 Launch and use the iVMS-4500 app on your smart TV, accessing and viewing the surveillance cameras you use on the generous screen of the TV.